Find out what our experts have to say about Suzuki Hayabusa! The Suzuki Hayabusa is a bike that needs no introduction after it was immortalized on the silver screen by Bollywood flick Dhoom. 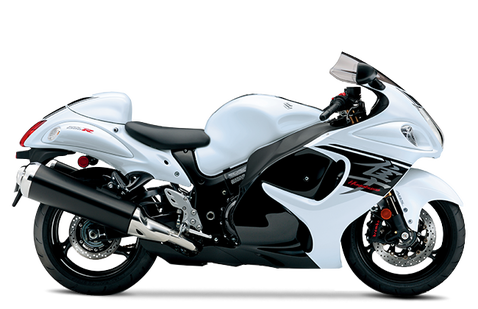 In its second generation, the Hayabusa continues to be the fastest and most recognizable bike across the globe. CKD production has dropped the price and given it a new lease of life as it was being overshadowed by its arch nemesis – Kawasaki Ninja ZX-14R. Choose the Suzuki Hayabusa which fits your bill! Choose the Suzuki Hayabusa which fits the bill of you. Glass Sparkle Black with Pearl Mira Red and Pearl White Glacier with Pearl Mira Red. The Hayabusa flaunts an iconic and dashing design language which has received only a handful of modifications over its lifespan of almost 20 years. It poses a dashing front profile with its headlight, teardrop-shaped clear lens blinkers and a windscreen, while the sides get full fairing side panels to cover the engine. The Hayabusa comes with an optional rear seat cowl which sets well with the overall curvy profile. It is one of the fastest and powerful things to move on two wheels. Powering the Suzuki superbike is a mighty 1340cc, 4-stroke, four-cylinders, liquid-cooled, engine, which generates close to 200PS of max power at 9500 rpm and a peak torque of 155 Nm at 7200rpm, making it one of the fastest and most powerful motorcycle engines. It can reach a top speed of 312kmph. The feature list includes dual channel ABS, halogen-bulb multi-reflector low beam headlamp and twin disc brakes at the front. The Suzuki Hayabusa is priced at Rs 13.60 lakh (ex-showroom Delhi) and competes against the Kawasaki Ninja ZX-14R. The Hayabusa has been exhibiting an iconic design for almost two decades now and there had been a very few tweaks to the overall look. That said, Suzuki had been updating the tiny bits, to keep it at par with today’s design language. At the front, it features a tongue-shaped headlamp, which houses a Halogen-bulb, multi-reflector, low beam. The teardrop shaped clear lens blinkers are placed next to the headlight and there’s a large transparent windscreen sitting on top of the headlight. No real changes at the front and the bikes looks the same as it did when first launched. The side panels feature full fairing and completely cover the engine components. The beefy fuel tank and curvy rear body panels remain almost unchanged. At the rear, the Hayabusa comes with wedge-shaped large body panels which are curvy and swept back. The LED tail lamp and clear lens indicators are identical to the front headlamp, along with a short rear fender. The split rear seat is hidden, however, there’s an optional rear seat cowl which blends well with the overall curvy profile of the motorcycle. The Hayabusa’s instrument cluster features a set of four round analogue gauges, that includes step-motor-driven tachometer and speedometer, fuel meter and coolant temperature meter. Also, there’s a round, centred LCD information panel which includes a clock, gear position indicator, S-DMS map indicator, odometer, and dual trip meter displays. There’s a lot to talk about the Hayabusa’s engine which is arguably the most powerful and the fastest two-wheeler engine in the world. Powering the superbike is a 1340cc, 4-stroke, four-cylinders, liquid-cooled, DOHC engine, which generates close to 200PS of max power at 9500rpm and a peak torque of 155Nm at 7200rpm. Power is transferred to the rear wheel through a six-speed constant mesh transmission. Forged three-ring aluminium-alloy slipper pistons provide superior strength, while PVD-coated rings bring down friction and improve cylinder sealing. The engine cylinders are coated with SCEM (Suzuki Composite Electrochemical Material) to improve heat transfer and ring seal, while the U shaped cut-outs at the bottom of each cylinder facilitates the air flow to the next cylinder on each downward stroke. The superbike also features the Suzuki Clutch Assist System (SCAS), which serves as a back-torque-limiting system for smoother downshifts and a light clutch pull. The Hayabusa is lightning fast and can reach a top speed of 312kmph. Braking duties are carried by top-of-the-line Brembo monobloc, 310mm twin-discs at the front and a 260mm single disc at the rear. On top of that, Suzuki has equipped the Hayabusa with lightweight, high-performance ABS to enhance the braking. It rides on 17-inch alloy wheels at both ends which are shod by tubeless Bridgestone tyres, 120/70 at front and 190/70 at the rear. The thick tyres result in a better grip while driving. Suspension setup comprises of 43mm inverted telescopic front forks and KYB shock with adjustable compression at the rear. With a wet weight of 266kg and a total length of 2190mm, the Hayabusa is both heavy and long. This makes it difficult to maneuver around in city traffic, at low speeds. On the other hand, its bulky profile provides its excellent agility and stability on long stretches and highways.